We stayed for 2 weeks in the house of Chantal and Catherine in Karon. The reality fits perfectly with the description. The complete documents sent during the reservation by the owners, relating to accommodation and visits, are very useful. The house is spacious, the surroundings very pleasant. The equipment is complete. Very charming. Rest assured because quiet neighborhood, supervised housing estate. Our contacts at the reservation and on site were very useful, very effective exchanges with the owners (wink for the orchids ...). The kids loved the pool, in the middle of the house, and the outdoor shower! The housekeeping during the stay was very good. The situation of the house is ideal: close to all shops and 5 minutes from the beach by walking. Everything is assembled to feel good: THANK YOU THANK YOU !!! Karon is a pleasant village for a family holiday. We recommend this rental at 200%. We spent 10 days in the charming villa of Chantal and Catherine. The care of the landlord was incredibly professional and warm, we felt very comfortable at any time. 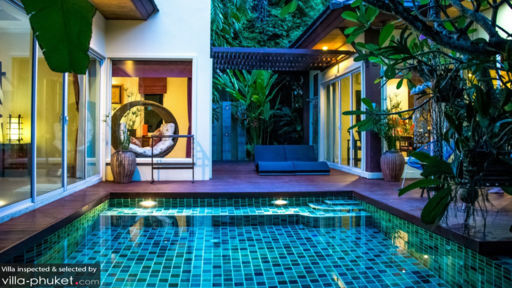 The villa is located in a quiet side street which branches off from the main street of Kata. The beach is about a 10 minute walk from the villa. It is the complete property in a very good condition. We felt very comfortable and thank you and cordially with Chantal and Catherine for the great holiday. We stayed 4 days last November in this villa my partner and I during our 3 week trip to Thailand, and everything was more than perfect. So far the best place we packed suitcases during our stay. Stylish and classy decoration, impeccable cleanliness, jaccuzy in the room with a superb outdoor pool that almost reaches the foot of the bed. 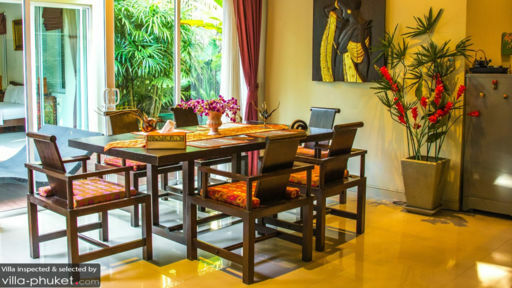 The villa is perfectly located, quiet, in a small corner of Karon and close to everything. There are restaurants and bars within a hundred meters and the beach is only a few minutes walk. What's more, the villa is the first after the guard post. For lovers of the crowds and nightlife, Patong is only 6 km away although there is quite a bit of evening entertainment in Karon. We are not the type to return twice to the same place, but we promised to return to this corner of Thailand and that is more than it is in this villa we will return! 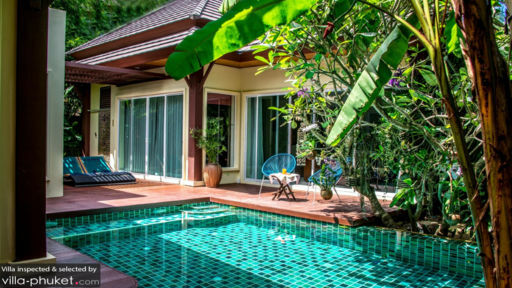 I note 5 stars for this magical place, but if I could put one more, I would do it without hesitation ..
We absolutely loved the villa at Karon, it was extremely quiet and relaxing. The bed was very comfortable and there was plenty of hot water for the shower and spa bath. Lounging outside by the pool was totally relaxing watching the wildlife pass by. Chickens, cats with kittens, roosters and little squirrels can be seen close by. The villa is close to all amenities including 7Eleven, fruit stalls, laundry and lots of local restaurants and street food. The beach is just a short stroll away. We adored the décor in the villa and used the cooking facilities each day. We were sad to leave and can recommend this holiday house with great pleasure. We stayed in this wonderful location for 2 weeks. The house is gorgeous and reflects all the information of the ad. There is nothing missing. Equipped with every comfort. And what about the pool? June is a month where rains alternate with the sun and when the sea was impractical, the pool was a manna from the sky !!! Waking up and being able to do a regenerating bath immediately or before going to sleep is something that does not cost !!!! Already I miss ..... Intimate and private! It enjoys a secluded and quiet environment outside the outside looks. Very beautifull! A corner of paradise. A special thanks to Chaterine and Chantal, the 2 owners who, while not in place, were always available by mail and WhatsApp. We arrived by night and they did find us everything we needed to have breakfast the following morning: milk, coffee, fresh fruit, juice, cereals, yoghurt etc., and with a 6 year old girl was much more than appreciated! The house is about 300 mt from the sea and in the 5 minute walk from there to the beach, you can find it all. From supermarket, banks, and restaurants. In short, great choice. I would highly recommend it to anyone looking for a relaxing and peaceful holiday, out of the chaos outside of Phuket.